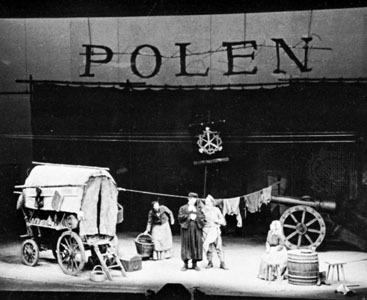 Brechtian captions were displayed in banners above the stage. 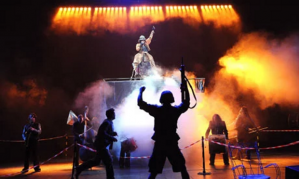 This production is the instantiation of Brecht’s epic, political theatre, as it is an obvious reaction and commentary on Nazi Germany and wartime Europe. 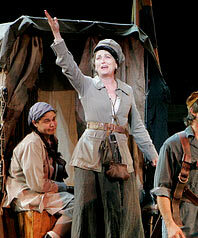 In 2006, George C. Wolfe directed a revival of Mother Courage in New York with The Public Theatre. This production starred Meryl Streep as Courage, with Kevin Kline as the Cook. It was performed at the Delacorte Theater, an outdoor arena in Central Park. For this production, Wolfe chose to use Tony Kushner’s new English translation. This translation aimed at a more colloquial rendition of the piece, using extra profanity, rhyme, and modernized language in order to better engage modern audiences with Brecht’s challenging work. The Brechtian songs in this production were set to an original score by Jeanine Tesori. The set pieces were made from weathered wood, and the setting captions, as in the 1945 production, were presented in banners above the action, though this time as projections. All-in-all, this production was set in a non-specific time and space, though its themes resonated loudly with the political war climate of 2006. The New York Times’ Ben Brantley, reviewer of this production, was unimpressed by this interpretation. 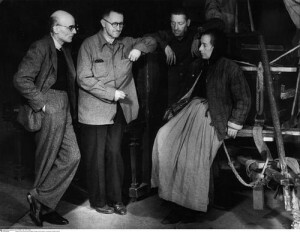 He asserts that the production on the whole, and Streep’s performance specifically, was lacking in cohesion and integrity to Brecht’s masterpiece. He comments that Streep’s rendition of Courage was sloppy and unconvincing, saying that she “emphasizes the gallows vaudeville of a play that has an all-too-reverberant relevance in these days of war.” According to Brantley his unclear, incohesive, and off-target tone was an overwhelming characteristic of this production, with its heavy reliance on comedy and spectacle and neglect of verfremdungseffekt and complexity. Brantley did feel, however, that Streep, and the whole production, shined in the moments of song, remarking that Streep could easily pursue a career in Broadway musical if she so chose. Overall, Brantley was unsatisfied with the incongruous elements of this production, from the design aspects through to the performance and the tone of the piece. New York Magazine’s Jeremy McCarter also commented on the peculiar and mistaken casting of Streep, again citing her lack of solemnity, composure, and grace. McCarter, too, was awed and disappointed by the level of spectacle and “showbiz” of this production, with its enormous flames and explosions, and large ensemble. He noted that the outdoor stage made the performance atmosphere unpredictable. McCarter was dissatisfied by Kushner’s translation, claiming that it was verbally challenging and confusing, as well as unnecessarily vulgar and simple. 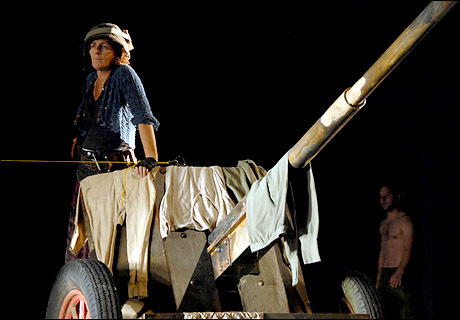 The National Theatre’s 2009 revival of Mother Courage and Her Children, directed by Deborah Warner, starred Fiona Shaw as Courage and also used Kushner’s translation of the original German text. The show was performed on a relatively bare stage, and featured live music by Duke Special and his band. Because of this, and the concert-venue stage space of the Oliver Theatre stage, this production took on a rock concert aesthetic and tone (Shaw entered at the top of the show wearing sunglasses). It was performed on a revolving stage, with visible technicians and crew members. In addition to banners onto which the setting captions were projected, this production also utilized recordings of the captions, read aloud by Gore Vidal. The sounds effects of the war were performed by one man at a mic-stand in the downstage corner of the stage. Charles Spencer, theatre reviewer for The Telegraph was unenthused by this lively production. Calling Warner’s production a “rock-and-roll circus,” Spencer asserts that aside from the live music of Duke Special and his band, this play was gimmicky and meaningless. According to him, Warner, and Shaw in her performance, lost all meaning in the pursuit of hipness. With a jaunty and energetic tone, Brecht’s magnum opus was rid of elements of intellectualism or political discourse. Though Spencer acknowledges that this production nods to the contemporary wars in Iraq and Afghanistan, he says that it is just that: a nod, without substance or follow-through. Michael Billington of The Guardian disagrees with Spencer’s analysis of Shaw’s performance. Though he too notes her occasionally inappropriate jauntiness, he remarks that she admirably and effectively captured the dichotomies that Courage represents and the opposing forces within her, “She is courageous and cowardly, philosophical and pragmatic” mother, businesswoman, and warrior. Billington also argues that the music is not as captivating as it should have been, and that there was a definitive un-Brechtian flavor to some of the moments, design elements, and general dramaturgy of this production. Overall, Billington praises this production for its update of Brecht’s old work, making it accessible to new audiences and breathing life and energy into its story. political goals with no unnecessary spectacle or fancy new spin. Live music does appear to enhance the tone of the show, as long as the tone of the music is congruent with the desired (and true) tone of the production. While both of these productions, like the original productions, were produced in social climates of war, neither directly addresses the contemporary effects of the wars, which was a main goal of the original writing and production of Mother Courage. Without directly addressing and engaging with the war climate and modern conceptions and effects of war, these productions could not capture the desperate and tragic themes of war within the play. 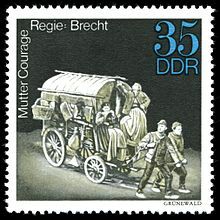 My production of Mother Courage and Her Children will overtly acknowledge the current wars in the Middle East, while perhaps connecting this wartime with wartimes of the past, just as the original production did in directly addressed WWII through the guise of the Thirty Years War. Billington, Michael. “Mother Courage and Her Children.” Rev. of Mother Courage and Her Children. The Guardian 27 Sept. 2009: n. pag. The Guardian. Web. 31 May 2016. <https://www.theguardian.com/stage/2009/sep/27/mother-courage-and-her-children-review>. Brantley, Ben. “Mother, Courage, Grief and Song.” Rev. of Mother Courage and Her Children. The New York Times 22 Aug. 2006: n. pag. The New York Times. Web. 31 May 2016. <http://www.nytimes.com/2006/08/22/theater/reviews/22moth.html>. McCarter, Jeremy. “The Courage of Their Convictions.” Rev. of Mother Courage and Her Children. New York Magazine n.d.: n. pag. New York Magazine Theater. Web. 31 May 2016. <http://nymag.com/arts/theater/reviews/19669/>. Spencer, Charles. “Mother Courage And Her Children at the National Theatre, Review.” Rev. of Mother Courage and Her Children. The Telegraph 28 Sept. 2009: n. pag. The Telegraph. Web. 31 May 2016. <http://www.telegraph.co.uk/culture/theatre/theatre-reviews/6239491/Mother-Courage-And-Her-Children-at-the-National-Theatre-review.html>. “Delacorte Theater in Central Park.” General CentralParkcom. N.p., n.d. Web. 31 May 2016. 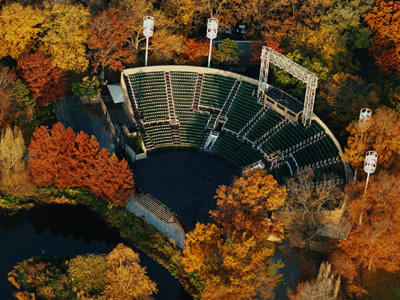 <http://www.centralpark.com/guide/attractions/delacorte-theatre.html>. 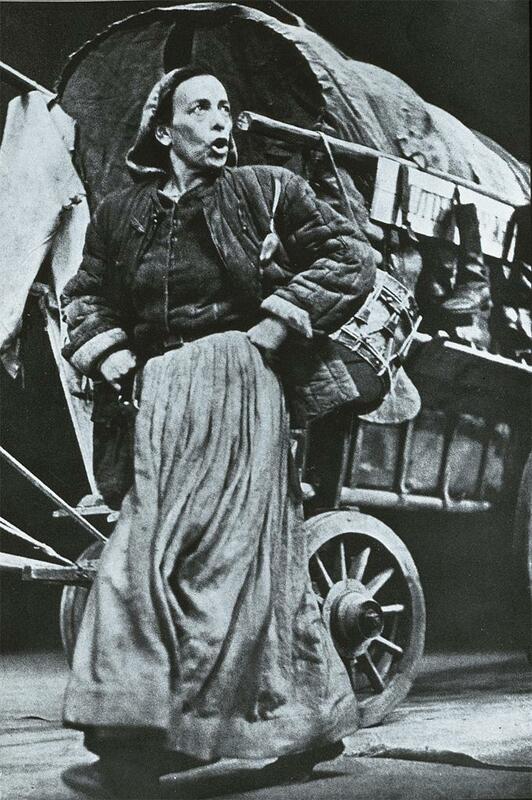 “Mother Courage and Her Children.” Encyclopedia Britannica Online. 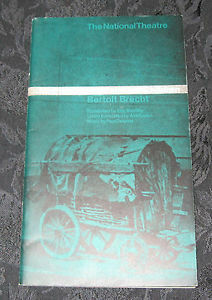 Encyclopedia Britannica, n.d. Web. 31 May 2016. <http://www.britannica.com/topic/Mother-Courage-and-Her-Children>. “Mother Courage and Her Children.” Wikipedia. Wikimedia Foundation, n.d. Web. 31 May 2016. <https://en.wikipedia.org/wiki/Mother_Courage_and_Her_Children>. “National Theatre’s Mother Courage Starring Fiona Shaw | Playbill.” Playbill. N.p., n.d. Web. 31 May 2016. <http://www.playbill.com/gallery/national-theatres-mother-courage-starring-fiona-shaw-com-2649?slide=0>. “Playbill MOTHER COURAGE AND HER CHILDREN Signed: Lynn Redgrave, National Theatre.” EBay. N.p., n.d. Web. 31 May 2016. <http://www.ebay.com/itm/Playbill-MOTHER-COURAGE-AND-HER-CHILDREN-signed-Lynn-Redgrave-National-Theatre-/151776564243>. “Heretic, Rebel, a Thing to Flout.” : Bertolt Brecht—Always a Refugee. N.p., n.d. Web. 31 May 2016. <http://patrickmurfin.blogspot.com/2016/04/bertolt-brechtalways-refugee.html>. Welcome to my final project site!